248 pages | 2 B/W Illus. The EU is a supranational organization, whose reach and influence extends well beyond its member states, especially to the many states that have signed various forms of association agreement with it. This book asks whether qualifying states who have eschewed EU membership experience negative effects on their legal and political self-governing abilities, or whether they manage their independence with few such effects. It explores the idea that the closer the affiliation a non-member state has with the EU, the more susceptible to hegemony the relationship appears to be. 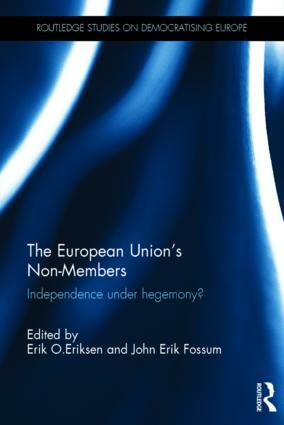 In addition, the book provides an overview of the total range of agreements the EU has with non-member states. This text will be of key interest to scholars and students of in EU/European studies, Scandinavian studies, European and comparative politics, international relations, and democratization studies. Erik Oddvar Eriksen is Professor in Political Science and Director of ARENA Centre for European Studies at the University of Oslo, Norway. John Erik Fossum is Professor in Political Science at ARENA Centre for European Studies at the University of Oslo, Norway. Routledge Studies on Democratising Europe focuses on the prospects for a citizens’ Europe by analysing the kind of order that is emerging in Europe. The books in the series take stock of the EU as an entity that has progressed beyond intergovernmentalism and consider how to account for this process and what makes it democratic. The emphasis is on citizenship, constitution-making, public sphere, enlargement, common foreign and security policy, and Europe society.